Coco Bertin weh na Director for Club for Young Rehabilitated Blind in Cameroon-CJARC say manna no di fall from heaven for blind pipo dem. Dis musician weh e di prepare e get three album, di try for helep oda blind pipo, say e no bi shidon wait make some man helep yi when e go blind. Coco weh e married and e get pikin dem, e di work for office (with computer weh be adapted software for yi handicap) don train laik 1000 blind pipo weh di work for office and some get business weh e give dem moni. BBC News Pidgin tori person Leocadia Bongben go meet Coco for e house make e tok e tori how e manage for di helep oda blind pipo dem today. "Ah be fifteen years when ah feel pain for my eye for three days, for number four day, I not fit see again. Ah blind totally, but ah no bi know, ah check say when ah wash my face ah go see again". "De thing be hard, I wan komit suicide, ah no fit imagine say young boy laik me, no fit see again. Ah bi accept for live for darkness, ah wan kill myself but ah no see anything for kill myself with. Finally, I just stay for house. Me weh ah laik football my friend dem di play football just behind my window, but I no fit komot. Ah stay laik dat for long time before my parent discover de Blue Blind school for Buea." Image example Coco surprise for oda blind pipo weh blind for de school though ah continue for worry say na me be de only young man. First taim e check say no be place for young boy, but as e dey with oda blind pipo e adjust and e learn how for use white cane. "Ah spend two interesting years for dat school". Life change again for struggle when Coco finish from de school. Coco be make friend with one oda blind man for school, dey join dia money weh school give for helep dem start, buy material for Douala begin make chair for e room. Den for Ministry of Social Affairs, work no dey, den deh ask for space for veranda begin work and keep their material for room when deh close and takam for morning. Deh ask space for minister den build 40meter square room with plank usam laik office and workshop. "We be di make basket, chairs and de place become laik house for blind pipo, deh bi di kam spend taim, train, read brail books for we small library and animate de place. Na for dat small room we grow idea for NGO for helep blind pipo". Image example Some big man given dem room deh work for some years, when deh appoint anoda person e drive dem out. E narrate how dey bi write 150 letters for company, and only 2 answer, one give 1,5million and anoda 10,000frs weh ah useam for make stamp. Odas give wood and dey build poultry where e still dey today for Ahala, quarter for Yaoundé. For Europe when Coco go computer training e tok with some pipo for France, Switzerland and Holland say deh need for get office. Na so dey build office and first lady, Mme Chantal Biya inuguratam for 2003. "Ah no be expect dat kain honour from government but dey recognise deh work weh we di do. First lady equip de whole centre from kitchen to room and office. Dat day weh e kam e bi na great moment for blind person". Coco di send message for blind pipo say manna no di fall from heaven make blind person pick. E say deh get everything except sight and make dey use dia head find thing for do. 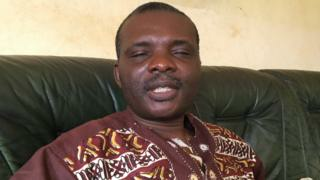 Though CJARC don train about 1000 pipo Coco say e no deh enough as 600,000 pipo get visual impairment for Cameroon. "We still need for train blind pipo and integrate dem for economic circuit". Image example E no bi easy to reach de place we dey today, wan taim we wan discourage leave everything Coco tok. For get inclusive society, Coco say, "we must sensitise government for understand blind pipo dia needs". Anoda challenge na how for build more classroom for take plenty blind pikin weh wan kam school. De first thing weh deh teach de pikin dem na brail, orientation and mobility for helep dem move without assistance. Social Affairs Ministry di give technical assistance, advice and na ministry weh e get smallest budget. "E mean say we kontri nova understand meaning for social affairs", Coco tok but e di hope say one day change go be.